“The Ground Beneath Her Feet” was the first release by U2 in the 2000s. 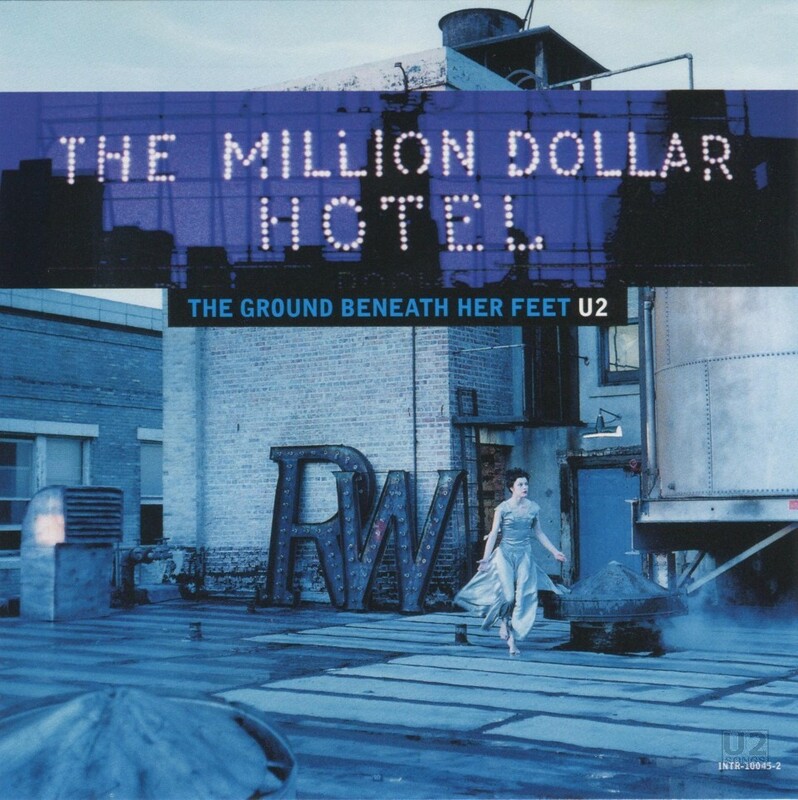 It was a promotional single, released to support the movie “Million Dollar Hotel” and the accompanying soundtrack on which Bono was executive producer. The movie itself had been co-written by Bono and he also makes a short cameo appearance on the screen. U2 had recorded “The Ground Beneath Her Feet” for possible inclusion on their album due in the Fall of 2000 with producers Danny Lanois and Brian Eno. It was felt that the song would not fit the album, and thus was given to Bono to use on the soundtrack project instead. It was one of two new U2 songs on the soundtrack, the other being “Stateless”. “The Ground Beneath Her Feet” did sneak onto that eventual U2 album, “All That You Can’t Leave Behind”. It was used there as a bonus track in Europe and in Japan. The song was written by Salman Rushdie, and the lyrics were included in his book “The Ground Beneath Her Feet”, Rushdie’s sixth novel which had been published in 1999. In the book, two characters, Ormus and Umeed vie for the attention of the same woman, Vina. The song is included in the novel as a song composed by Ormus after Vina’s death. There was no commercial single, but a video for the song was filmed. It has been suggested that a full commercial release was considered, but U2 felt the timing was too close to their fall release of a new album, and didn’t want to draw attention away from that. A number of promotional releases were issued around the world. In the UK, the 5-inch CD was issued in a double card sleeve. The outer sleeve is plain blue with the catalog number on the back. This sleeve has a cut out rectangle, so you can view the title on the interior card sleeve when it is in place. This version of the promotional release contained both the title track, and also the trailer for the movie. In the USA, a 5-inch promotional single was produced as well containing no multimedia components, just the title song. It was released in a regular jewel case with front and back inserts. A promotional single was also issued in Brazil, where it was released in a slimline jewel case containing just the audio track. A CDR was also issued in the UK containing the title track – it was released in a plastic slip case, with a paper insert listing track information. U2 with guest Daniel Lanois on pedal steel. Music by U2. Lyrics by Salman Rushdie. Taken from his book, “The Ground Beneath Her Feet” (1999). Produced by Daniel Lanois and Brian Eno. Engineered by Richard Rainey. Mixed by Tim Palmer. Strings by Craig Armstrong. Programming by Leo Pearson and Danny Saber. Additional engineering by Mark Howard. From the original soundtrack album “The Million Dollar Hotel” produced by Hal Wilner. All photography taken from the movie “The Million Dollar Hotel” courtesy of the Botash Group. Sleeve Design: ABA Dublin.